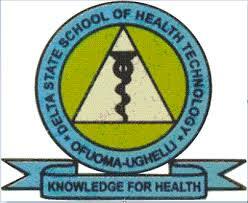 Delta State College of Health Technology, Ofuoma-Ughelli ND, HND and Certificate Programmes Admission Forms Method Of Application, Closing and Entrance Examination Date for 2019/2020 Academic Session. Applications are hereby invited from suitable qualified candidates for admission into the Delta State College of Health Technology, Ofuoma-Ughelli for the 2019/2020 academic session. (ii) Nutrition and Dietetics (2yrs) H.N.D. (i) Medical Laboratory Technicians Course (3yrs) Tech. Cert. (ii) Re-trainee Medical Laboratory Technician (2yrs) Tech. Cert. Prospective candidates should possess five (5) credits at WASC, NECO, or GCE ‘O’ Level at not more than two (2) sittings. The five credit must be in the following subject; Biology, English Language, Mathematics, Chemistry and Physics . Retrainee JCHEW: Prospective candidates must be holders of JCHEW certificate with at least two (2) years of post qualification in addition to (Ai) above. Prospective candidates must possess three (3) credits WASC, NECO, SSSC, or GCE ‘O’ level examination at not more than two (2) sittings. The three (3) credits must include: English Language, Biology, Mathematics and any other two passes which include (i) an one of Physics, Chemistry, Geography, Food and Nutrition, and anyone (1) of Economic, Agricultural Science, Accountants or Commerce. Prospective candidates should posses four (4) credit passes in WASC, SSCE, NECO or GCE ‘O’ level examinations. The four (4) credits and one (1) should be in the following subjects, Physics, Chemistry, Biology, Mathematics and English Language. Prospective candidates should possess five credits passes in WASC, SSCE, NECO, or GCE ‘O’ level examinations at not more than two (2) sittings or its equivalent as may be approved by EHORECON or WAHEB. The subjects must include: English Language, Mathematics, Biology, Chemistry and Physics. Prospective candidates must possess National Diploma (ND) in Environmental Health Technology with evidence of completion of one (1) year relevant work experience (Industrial Training) in addition to Ci above. Prospective candidates should possess three (3) credits and two (2) passes in WAEC, NECO, and GCE ‘O’ level or Teacher (TC II) certificates at not more than two (2) sittings. The three (3) credits and two (2) passes must include the following subjects: English Language, Biology/Health Science. Geography, Physics, Chemistry, Agricultural Science, Technical Drawing and any other subjects. Mathematics would be an advantage. Note: For the purpose of this course science subjects are: Biology, Chemistry, Physics, General Science and Health Science. Prospective candidates should possess four (4) passes in WASC, SSSC, and GCE ‘O’ level or NECO GRADE II or NABTEB certificates at not more than two (2) sittings. The four (4) passes must include a pass in one (1) Science subject, Biology/Health Science, Chemistry, Nutrition, Physics, General Science or Integrated Science and English Language. Note: Combined results for Gi – Gii must be from the same examination body. i.eSSCE and SSCE or NECO and NECO. Prospective candidates should possess four credit passes in WASC, SSSC, and GCE ‘O’ level or NECO examinations. This credit passes should include Mathematics, English Language, Biology or Health Science and any one (1) of the following subjects: Chemistry, Economics or Geography at not more than two (2) sittings. Prospective candidate should possess five (5) credits in WASC, SSCE or GCE O’ Level or NECO examinations. This credit should include Mathematics, English Language, Biology/Health Science, Chemistry and Physics. Prospective candidates must possess five (5) credit passes in WASC, SSC, GCE ‘O’ level, NECO or NABTEB examination or its equivalent, which must include credit in English Language, Biology/Health Science, Chemistry/Physics, Mathematics and any one other subject at not more than two (2) sittings. Prospective candidates must possess five (5) credit passes in WASC, SSCE, GCEO’level, NECO or NABTEB examination or its equivalent which must include English Language, Biology, Chemistry/Physics, Mathematics and any other one subject at not more than two sittings. a) Prospective candidates must possess National Diploma (ND) in H.I.M with minimum Lower Credit or Professional Diploma in H.I.M by HRORBN, with evidence of completion of one (1) year relevant work experience in an accredited health institution approved by the Board, b) Candidates with a pass (GPA 2.00 – 2.49) at the ND level with two (2) or more year post ND cognate work experience may be considered for admission into the HNDprogramme. c) In addition to Eii above. Prospective candidates should possess four (4) credits passes in WASC, SSSC and GCE ‘O’ level or NECO examination at not more than two sittings. The subject must include: Chemistry, Biology/Agricultural Science and any other two (2) of the following: Mathematics, Food and Nutrition, Physics, Economics/Commerce, Health Science, Home Management, English Language, Basic Catering ad Food Services. At least passes in English Language and Mathematics are compulsory. Prospective candidates should possess the requirement for Fiabove, a minimum of Lower Credit (CGPA 2.50 and above) in the cognate ND examination and a minimum of one year cognate work experience. In exceptional cases, ND Diploma with(CGPA OF 2.49) in the ND examination that had two or more years of cognate experience in the specific field may be considered for admission into the HNDprogramme in Nutrition & Dietetics. Prospective candidates must possess five (5) credit at not more than two (2) sittings in WASC, SSCE, GCE ‘O’ level, NECO or NABTEB examinations. The subject must include credits in Biology, Chemistry, English Language, Mathematics at not more than two (2) sittings. (Gii) Retrainee MLA: Prospective candidates must possess Medical Laboratory Assistant Certificate with two (2) years post qualification in addition toGi above. (Giii) OND (in SLT): Candidates with OND in SLT in addition to the requirements in Gi above may be considered for admission into the 200 level of the programme. Prospective candidates must possess five (5) credit passes which must include: English Language, Mathematics, Biology, Physics and Chemistry subjects in WASC, SSCE, GCE ‘O’ level or NECO examinations at not more than two (2) sittings plus either b, c or d below. Registered Midwife (RM) Certificate or any other basic nursing certificate e.g Psychiatric Nursing certificate plus one year post qualification. BNSC candidate from Universities accredited by NUC, NMCN and WAHEB. a) Prospective candidates must possess five (5) credits which must include: English Language, Mathematics, Biology and any other two (2) Credits in WASC, SSCE, GCE or NECO examination at not more than two (2) sittings. Prospective candidates should possess five (5) passes in WASC, SSCE, GCE ‘O’ level or NECO examinations at not more than two (2) sittings. The passes must include: English Language, Mathematics, Biology and any other two (2) relevant subjects. Prospective candidates should possess WASCE, SSCE, GCE ‘O’ level or NECO certificates with five (5) credits which must include English Language, Mathematics, Chemistry, Biology and Physics at not more than two (2) sittings. Prospective candidates should possess three (3) credits in GCE, WAEC, SSCE, or NECO which must include: English Language, Mathematics and one (i) of either Chemistry, Physics or Biology at not more than one sitting. Prospective candidates must possess five (5) credit in WASC, SSCE, GCE ‘O’ level or NECO examinations at not more than two (2) sittings. The subjects must include English Language, Mathematics, Chemistry, Biology and Physics. Prospective candidates should possess five (5) credits in GCE, WASC, SSCE or NECO which must include: English Language, Mathematics, Physics, Chemistry and Biology at not more than two (2) sittings. Prospective candidates should possess four (4) credits in WASC, SSCE, GCE ‘O’ level or NECO which must include: Biology, Chemistry, Physics and English Language Mathematics and any other two of the following: Biology or Agricultural Science, Chemistry and Physics. Note:All candidates applying for National Diploma (N.D.) programmes are required to obtain JAMB form and sit for JAMB examination as well.